Depo Provera (depot medroxyprogesterone acetate, or DMPA) is a contraceptive that's given by injection four times a year. Each depo shot releases progestin, a synthetic form of the female hormone progesterone, that protects a woman from getting pregnant for between 11 weeks and 14 weeks. There are two types, the original Depo Provera shot and Depo-subQ Provera 104 (which has been found to be an effective treatment for endometriosis as well as a contraceptive). There are many advantages of using Depo-Provera. As long as the injections are given on time, both types are 99.7 percent effective. It allows for sexual spontaneity and moms who are breastfeeding can safely use it. But it's not without side effects. For instance, it can take as many as nine or 10 months to regain your fertility after you take your last shot. And in clinical studies, a very small percentage of women have skin reactions to the shots: dimpling or lumpiness around the injection site. If you don't mind getting shots and you're looking for a form of birth control that you don't have to think about every day, Depo Provera could be a great option for you. To help you decide if you'd like to try it, here are some common side effects to consider. 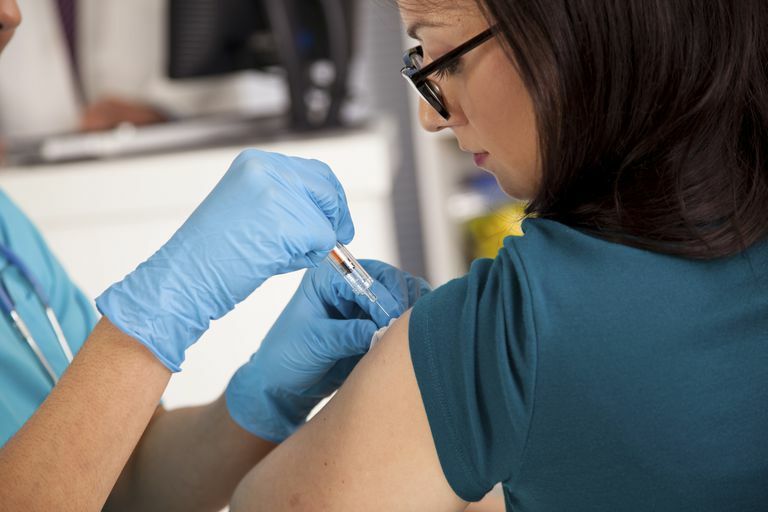 After getting your first injection of Depo Provera, your body will likely go through changes as it adjusts to the hormone. For some women, this can mean irregular bleeding (spotting) or even prolonged bleeding that's similar to a regular period. This is perfectly normal, especially during the first three months of using Depo Provera. There's no way to know before you try the contraceptive if spotting or bleeding will be an issue for you, but you can always switch to another form of birth control if it is and it bothers you. This is one side effect that women often cite when they quit taking Depo Provera. During the first year, on average most women who go on Depo Provera gain between 3.5 pounds and 5 pounds. It does seem that body weight and fat appear to increase with the use of DMPA. This gain usually is temporary though. Research has shown that women who used nonhormonal contraception after discontinuing Depo Provera lost the weight within two years. In clinical studies, 39 percent of women found that their periods completely stopped by the end of six months of using Depo Provera. After nine months, about half of women's periods had stopped. Among the remaining women, 57 percent reported that their periods had stopped by the end of a year. The package inserts for both Depo Provera and Depo-subQ Provera 104 contain a mandated black box warning about the possible reduction of bone mineral density due to the loss of stored calcium in bones. The longer you're on Depo Provera, the more bone loss you're likely to have. Make sure you talk to your gynecologist about this potentially serious side effect.